Strategy Series #1: Engineering - How best to develop your game? There has been a great deal of debate in the community around engineering games and clan war rosters. Unfortunately, there has been even more misunderstanding of the whole topic. Engineering a game is not the same as engineering a clan war roster, although engineered clan war rosters are comprised of engineered games. When engineering a clan war roster, the goal is to build it such that the matchmaker sets you up against a weaker opponent that can be easily defeated by the engineered clan's overpowering offensive capability while offering the weaker clan top defenses they can only hope to get one star against, much less two. It's a valid, viable strategy in the game...and hotly contested. Engineering a game, on the other hand, is the most efficient way to play the game. Engineering comes in many forms ranging from strategic rushing, to defenseless, to x.5, and more. The simple reality is that EVERYONE engineers their game to some degree; it's really just choosing what you believe to be the best way to upgrade your game. (Some players are just a bit more...extreme with the practice.) Under current game logic, this typically means stressing offense over defense with the most extreme rendition being the defenseless game while a more subtle form is the x.5 upgrade strategy. A defenseless game is just that - a game where the player focuses strictly on offense and simply does not develop defenses. In this strategy, a player will usually have only one, level 1 cannon (can't avoid it; it's part of the startup demo) and maybe traps. Some will drop hidden tesla towers, and another variation will include walls of some level (usually not maxed for their TH). It's a serious challenge to develop such a game; you have zero loot retention and you do not always earn a shield when attacked, even if you are three starred. The benefit in clan war (currently) is that you are consistently ranked at least two TH levels below your offensive capabilities and keep a very low war weight, helping your clan draw better matches. Of course, these bases are quickly and easily three starred well below their TH level; I've seen a TH7 defenseless game three starred by a TH5 and the disparity between attacker and defenseless TH level grows as the game develops. The Naid Cosanta game on Divergent Void (#P8CGRG0C) is an example of a defenseless game. It was just recently upgraded to TH8, but as a TH7 in our last war it was ranked below our strongest TH5 game. The x.5 upgrade strategy is similar in benefit, although not quite as extreme. An x.5 game is when a TH9-TH11 player does not drop new defenses but instead maxes offense and existing defenses first. For example, when upgrading to TH9, players can buy an archer tower, wizard tower, air defense (AD) air sweeper (AS), hidden tesla, and two x-bows. The TH8.5 player will not buy any of these items, save maybe the hidden tesla and AD/AS. He'll pick up the archer queen (AQ), any new traps and walls, as well as the new storages because these do not add significantly to war weight. From there, he starts upgrading everything to TH9 max levels, including walls. He puts his heroes (archer queen and barbarian king) down for upgrades frequently and keeps the lab cooking troop upgrades nonstop. Once everything is maxed, including most troops, he will drop the remaining defenses (other than x-bows) and max them. Then, finally, he drops the x-bows and maxed them. TH9.5 (no infernos) and TH10.5 (no eagle artillery) follow the same, general course. Somewhere between these two is the "mini-max". Also focused on offense, this game strategy builds only key defenses and maxes them. This player will have a low war weight but be much more difficult to take down than a defenseless game. Whereas a defenseless game can be three starred by games two or more TH levels below, the mini-max usually requires someone at the same TH level (or well along at one below) to be three starred. An example would be the Zed Verteidigung game on Divergent Void clan (#P8CGRG0C). Strategic Rushing is a form of engineering where you move quickly up TH levels, focusing on offense to the detriment of defense. A typical rushed base will have two or more levels of defense below the current TH level and troop upgrades are usually farming troops (giants, barbarians, archers, wallbreakers, etc) rather than war troops or spells. This is not done to achieve lower war weight, but rather with the end-game in mind. 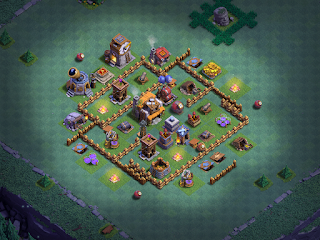 The strategic rusher has the single goal of reach TH11 as quickly as possible. This player realizes that loot retention is fantasy; games are going to be tacked regularly and the best loot is at higher levels and leagues, so the faster you get there, the faster you can develop your game. Strategic rushing also maximizes both builder and laboratory time; there is never a reason for this player to have an excess buildup of resources. For examples of a strategically rushed games, see either the Clash Maniac (subject game of the "Journal of a Rusher" thread here) or the Kuss von Nacht games on our clan, Divergent Void (#P8CGRG0C). A big difference between strategically rushed games and others noted above - these games will usually drop all of their defenses and still rank among their peer TH levels. Kuss von Nacht consistently ranks #1 or #2 when placed in clan wars as he has maxed level infernos and eagle artillery, all four x-bows, inferno towers that are one level away from being maxed out.... Strategic rushing is not done with clan wars in mind and often increases overall war weight. As you might guess, a savvy clan can use these strategies to their advantage. If a defenseless game ranks consistently two levels below the TH and an x.5 game ranks one below, then having a bunch of them on your clan roster with a couple of heavy hitters on the top will all but guarantee you'll draw in a maxer clan unable to three star your top games. The strategies on their own are just decent upgrade strategies (or a challenge in the case of the defenseless game) but when they're brought together in a clan, it's a whole other ballgame. Placing low ranking games (such as TH3-TH5) at the bottom of the lineup is still useful, but having a few defenseless and x.5 games in the lineup really solidifies the advantage. Here's the catch though - although each of these strategies will result in an offense capable of handling opponents with much, much stronger defenses...that doesn't mean the player will be able to take advantage of the stronger offense. Some players sacrifice time on the learning curve to develop these games and/or develop limited attacks. In a sense, they over-engineer themselves along the way. There are many complaints about engineered games and clan war rosters on the official forums *BUT* most of the time the complaining player's clan ends up winning. If they don't, it's usually because they lack attacking skills themselves. In this sense, it usually works out. For my part, I enjoy all modes of gameplay (except x.5) and play it all ways. I max, I rush strategically, I have a defenseless, I have a mini-max. I have a TH11 that I rushed from a brand new TH7...then played like mad for 7 months to get to where it is largely running TH9 defenses with near-max offense today. My main game (Noctaire) is a strategically rushed TH10; I do not put emphasis on walls but rather on offense then defense, and I upgrade it to the next TH level once I have key troops maxed and most defenses maxed. Each strategy offers a lot of value in the game and is lots of fun. SuperCell is aware of the issue some of these playing strategies may cause in clan wars; I say clan wars because they don't really offer any problems for regular multiplayer at all. SC has suggested they'll be doing something to bring it under control. What that something will be, and how far they'll backfill the rabbit hole, is anyone's guess at this point. Many players contend this is much ado about nothing - yes, it's an unfair advantage but it actually makes wars more challenging and the non-engineered clan typically wins. Others clamor for easier matchups and contend these highly engineered clan rosters really put a damper on clan war gameplay.